The Psalmist and Brian Williams remind me of one of the loves of my life putting puzzles together. Several times as I was recovering from hip surgery my son and daughter-in-law bought me a puzzle and I would sit by the hour and assemble them. At first it was to ease the boredom but suddenly it symbolizing my life. As the jumbled hodgepodge of multiple shaped cut cardboard with a slice of picture on one side fit together I could see how everything that had happened and was happening to me was fitting together. Before my eyes life was coming together not as crazy shaped hodge-podge of cut up cardboard but as a single picture filled with a strange sense of coming together accompanied by a strange and powerful sense of Peace. And believe it or not somehow as I turned each piece to see if it fit it with the developing picture I was able to sense God’s hand blessing me, helping me form the beautiful picture my life has become. After the puzzle was completed and I gazed at the completed puzzle with all of the “scar lines” where the picture was cut to form the puzzle I thought about all the “good” things and “bad” things that has either happened to me or committed by me. Isn’t it amazing how God can take the miss-mash of our lives and create a beautiful picture? And the miracle is that he forms us into a beautiful picture without removing all our blemishes. 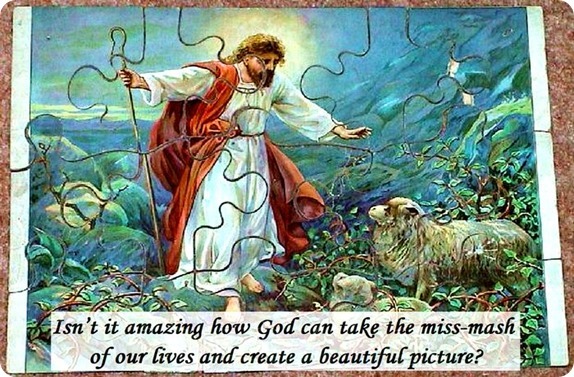 If you’re life seems in a 1000 pieces go to a department store purchase a puzzle and as you begin putting it together ask God to help you and then experience the miracle!